They tend to service areas of Manhattan that are not located close to subway lines (especially far East and West areas of Manhattan). They are also a convenient option for traveling Crosstown (between Manhattan's East and West Sides). Buses offer the added advantage of being able to see various areas of Manhattan while you ride. Buses can also be a great choice if you're traveling with small children because although they are slower, they require fewer steps/walking than using the subways does. Also, they tend to be cleaner than the subway. Fare can be paid with a MetroCard or coins (no dollar bills, no pennies). A free transfer to another bus or the subway within 2 hours is available if you paid with a MetroCard. If you pay cash you can ask for a transfer, but it is only good for transferring to another bus (not to the subway) within 2 hours. You must wait for buses at designated bus stops. As you see the bus approaching your stop, you can put your arm out to indicate to the driver that you want to board the bus. Enter the bus through the front doors and pay your fare. Take a seat or move toward the back of the bus to make room for other people boarding the bus. To request a stop: Pull the cord or press the black band near the windows. A "Stop Requested" light will illuminate at the front of the bus. Exit through the doors at the rear of the bus. The majority of buses in Manhattan run either Uptown/Downtown or Crosstown. Crosstown buses run East and West along major streets(42, 34, 14 etc.) and stop at almost all Avenues. 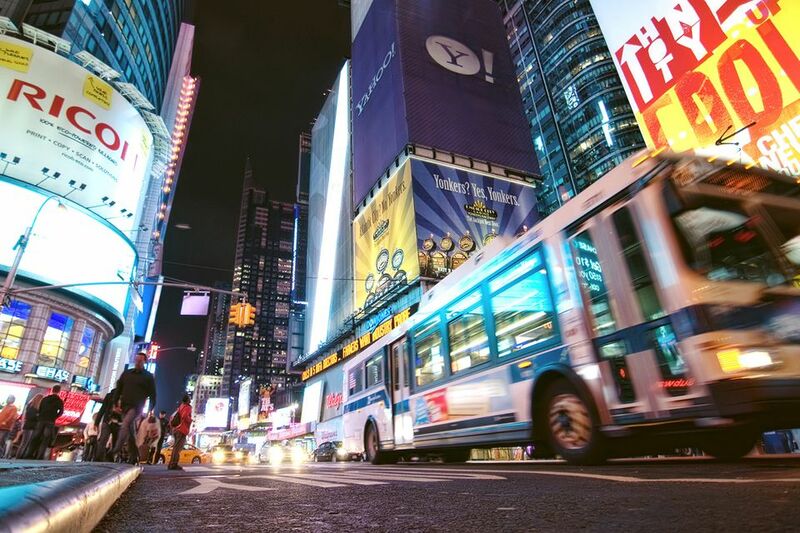 Taking a crosstown bus can be a great solution if you need to travel east/west in Manhattan since there are only subways that run crosstown along 14th Street and 42nd Street. Uptown and Downtown buses run north or south along most Avenues (1st, 2nd, 3rd, Lexington, etc.) in the direction that traffic flows on that street. Uptown/Downtown buses often include both local and express routes. A sign in the front window of the bus will normally indicate if it is express bus - ask the driver if you are unsure. If you are waiting at a bus stop wanting to be picked up, you should make sure you wave to the bus driver if they approach and don't seem to be slowing down. They will usually stop if they see someone waiting at the bus stop, but it's not always clear who's waiting for a bus. Local buses will stop every 2-3 blocks upon request. If you want the bus to stop, you need to push on the black strip to request a stop. Otherwise, the driver will only stop if there is someone waiting at the bus stop to be picked up. Buses running express only stop at specified cross streets.